Our weekly Student Night is back with insane student discount on incredible 2-for-1 mixed drink deals, buckets and jugs of beer, and Jagerbomb trains like you've never seen before! Plus 25% off our international food menu with a late kitchen. Plus, the live paella experience from the guys at Paella Club Barcelona starting at 20.00 on what is Barcelona's official day of the week for Paella. Live cooking, great food. ESN, Erasmus and other cardholders get a free house shot on arrival but all our welcome for a night of beer pong, drinking games, great tunes, and all round madness. 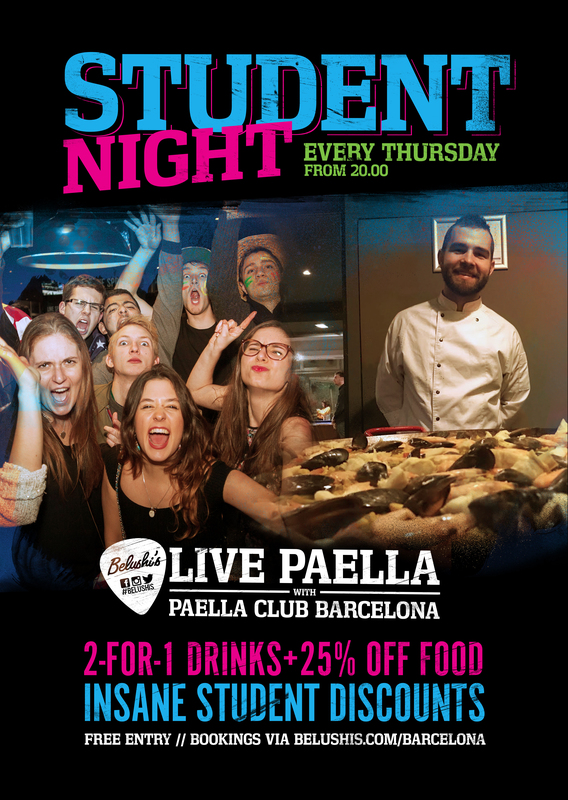 Belushi's offers live sports from Spain, UK, the EU, the USA and Australia and sits underneath a 400-bed youth hostel so you'll find our bar packed with locals, expats, backpackers, exchange and local students all year round. Attendees already confirmed from all of Barcelona's biggest campuses!